We’ve held a number of workshops to discuss some key themes from our Empowering Young People programme – see our previous blog. Based on these discussions we’ve decided to post some blogs on the key programme themes that raised the most questions. We hope you find them helpful. We will only consider funding projects under our Empowering Young People programme that can show us that young people and their support networks and communities are fully involved in the development, design and running of the project. By support networks and communities we mean the people who have a role in the everyday lives of the young people you’re going to work with. These might be families and carers, people in groups they attend, teachers or social workers. They can encourage young people to get involved and attend the project. Base the design of your project on what they say. Ask for ideas for activities, guidance on things like timing and venues and advice on what they think will work or what can be improved. We want to know how young people and their support networks and communities will be involved in running the project. Tell us how you will make sure that the voices of young people will continue to be heard and their advice acted on. For example, are you are going to set up forums, youth committees? If so, how often will they meet? Consider how you will take on board their suggestions or advice. 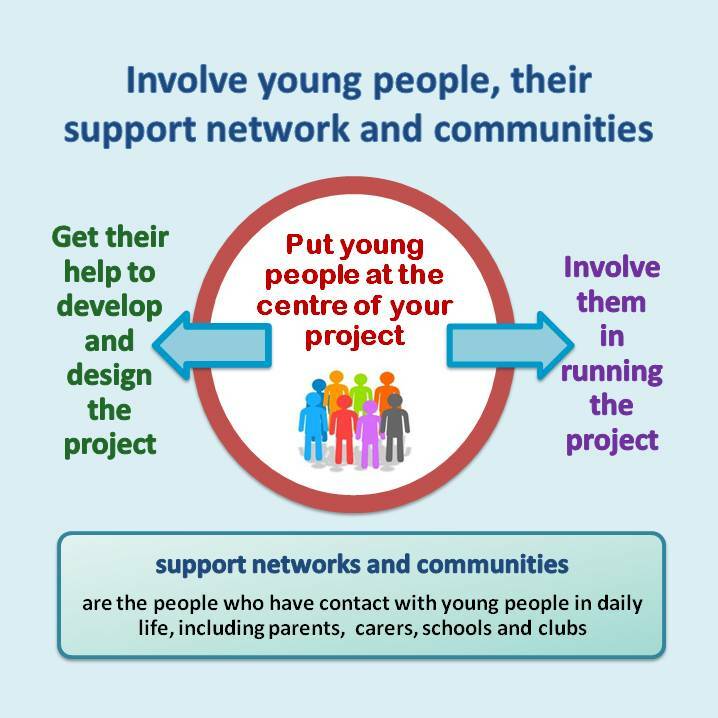 What roles can young people take on to help deliver the project? Are there opportunities for volunteering, peer support, mentoring, planning activities, marketing and promotion, including social media? How will they be involved in evaluation? Committing to working with young people in this way takes resources and staff time. Make sure that everyone in your organisation supports this. Include the costs of doing this in your project budget when you apply. Ask young people how they can help – and keep asking them! Take on board their ideas. Have a range of opportunities to suit different skills, confidence levels, interests and abilities. Plan and allocate resources to support this work. Include this in your project budget when you’re applying.